Duvet vs Comforter - What is the difference? Duvet vs Comforter, What is the Difference Between a Duvet and a Comforter? Duvet vs Comforter, such an old bedding question, but a good one: What is the difference between a duvet and a comforter? Which is the best bed cover option to use, to accentuate your bedroom decor? The truth is, it probably is a matter of practicality, but some might even make this decision solely based on aesthetics. Here, we will examine the pros and cons of both bedding cover options. For someone who is trying to keep their bedroom simple, a comforter might be the right choice. It is a 1-piece bed cover option and it is relatively thin compared to a duvet. Comforters allow you to create a smooth and sleek line along your bed and they tend to go directly on top of the traditional flat sheets. They are usually quilted, and do not have a “top” or “bottom” side, which means they are reversible. In most cases, they are less durable than duvets because every time they are washed, the whole comforter must be thrown into the washing and drying machine. Furthermore, you can also wash the duvet cover only, which reduces the strain you will place on your washing and drying machines. Bamboo duvet covers are extremely soft, extremely durable and can last for a very long time. 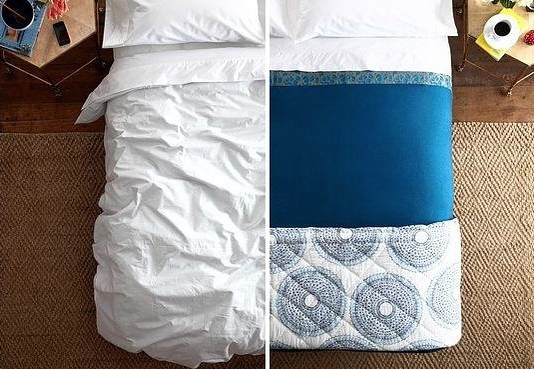 So, which do you prefer comforters or duvets? Ultimately, it’s your choice, and either option can provide the finishing touch to your bedroom’s decor. Bamboo Sheets Shop continues to be a great online store where to buy duvet covers!